Writing is how I attempt to repair myself, stitching back former selves, sentences. When I am brave enough I am never brave enough I unravel the tapestry of my life, my childhood. 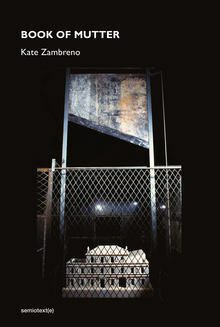 Composed over thirteen years, Kate Zambreno’s Book of Mutter is a tender and disquieting meditation on the ability of writing, photography, and memory to embrace shadows while in the throes—and dead calm—of grief. Book of Mutter is both primal and sculpted, shaped by the author’s searching, indexical impulse to inventory family apocrypha in the wake of her mother’s death. The text spirals out into a fractured anatomy of melancholy that includes critical reflections on the likes of Roland Barthes, Louise Bourgeois, Henry Darger, Theresa Hak Kyung Cha, Peter Handke, and others. Zambreno has modeled the book’s formless form on Bourgeois’s Cells sculptures–at once channeling the volatility of autobiography, pain, and childhood, yet hemmed by a solemn sense of entering ritualistic or sacred space. Neither memoir, essay, nor poetry, Book of Mutter is an uncategorizable text that draws upon a repertoire of genres to write into and against silence. It is a haunted text, an accumulative archive of myth and memory that seeks its own undoing, driven by crossed desires to resurrect and exorcise the past. Zambreno weaves a complex web of associations, relics, and references, elevating the prosaic scrapbook into a strange and intimate postmortem/postmodern theater.